A bad witch's blog: I'd Like to Thank my Friends for a Lovely Birthday! I'd Like to Thank my Friends for a Lovely Birthday! It was my birthday yesterday. Friends came over to chat, play board games, eat birthday cake and have some wine. I had a lovely time! I also got given some wonderful witchy presents, which I have photographed. 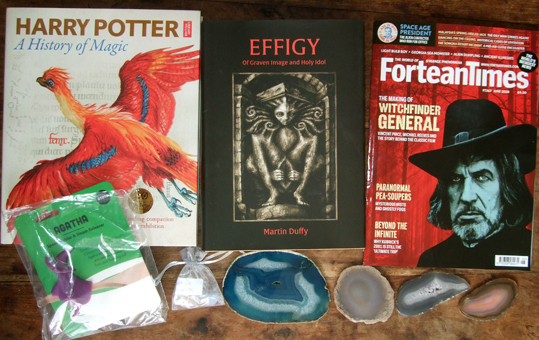 My hubby bought me a subscription to Fortean Times and a copy of Martin Duffy's book Effigy, which I have wanted ever since I heard him talk about it at The Nameless Arte last autumn. I also got some sparkly rocks and crystals, a copy of the Harry Potter - A History of Magic book and a little witch-shaped spoon holder. Several other friends gave me bottles of booze, which I will very much enjoy. Thank you so much - it was a perfect day and I love my pressies! I've been thinking about that. I know we have at least two trained gardeners in our local moot and I'm going to ask them for help and advice. Thanks so much for the seeds!